I'm in love with Belgian-style beers. This isn't so surprising to anyone who's had a Belgian, which is probably the most luscious type of beer on the planet. This lusciousness isn't limited solely to creme de la creme Belgians like Trappistes Rochefort 10 or Duvel; even the mediocre Belgians have a certain sumptuousness to them. In fact, I've discovered that I love Belgian-style beers so much that crave them more than beers from any other beer style, even more than the hophead's Holy Grail, the India Pale Ale. So when we decided to do an impromptu roundtable on Thursday, I immediately suggested Brugge Brasserie for the event. The other Knights needed no arm-twisting to go there, so go there we did. Two seasonals were on the beer menu: Thunder Monkey (5.5% ABV) and Impérial (8% ABV). We all warmed up with the Thunder Monkey, which was a fantastic choice. This ale was easy-drinking stuff. It poured with a cloudy reddish-brown color. The nose on this beer was classically Belgian. It evoked plums, vanilla, yeast, and most of all, cloves. Despite these fairly strong nose characteristics, the Thunder Monkey was pleasantly mild and fruity in flavor. The cloves were there, too, but they didn't dominate the beer. A wonderful beer - 4.25 mugs. The Impérial arrived next at our table with the same visual character and hue as the Thunder Monkey. But the Impérial was a different beast altogether. The nose was powerfully malty and possessed brandy-like notes. The taste was a bit boozy at first; it reminded me of an extra-potent barleywine with its huge fruity and sugary traits. The mouthfeel for this beer was B-I-G; in other words, it was extra-chewy. I must confess that at first sip, I really didn't care for this beer, especially after quaffing the easy-to-drink Thunder Monkey. But when I paired some frites (thanks, Matt and Kelly) and stew with the Impérial, I found that the food muted the power of this beer and made it much more appealing. 3.75 mugs. I'd be lying if I said I was anything less than enamored by the work the Brugge Beer's Ted Miller, but that doesn't mean that I think he's incapable of misstep. All I can say from personal experience is that Ted hasn't let me down yet. Our warm up was the Thunder Monkey, a beer that seems to randomly appear on the Brasserie menu. This one is bubbly like a soda, with an opaque and dark mahogany color. A sweet tart nose leads into a beer that tastes of plum and a hint of clove. I also got a quick hint of tartar sauce. Might have been something in the air though. As usual, this one was tight and super drinkable. 3.85 Mugs. Next up was what Ted calls Impérial. When the waitress brought this beer to our table, we thought she had brought us the Thunder Monkey again - the appearance of both beers was dead-on. This beer had that same old welcome Brugge nose, with a watery front and "some weird thing on the back" (my notes). A brandy-like hard liquor burn was expected, but never appeared. A sugary sweet fruit character made it's way out, with hints of pear making their way to the forefront. After half the glass the booze came out - a hard liquor character without the hard liquor punch is what best describes the overall character of Impérial. 3.85 Mugs for this one as well. We started off at the bar, while waiting for a table to open up for the five of us in attendance. I hadn't expected the Brugge to be deserted (as much as I love it, someone else is bound to) but nor did I expect it to be as packed as it was on a Thursday. Anyway, we all started off with the Thunder Monkey. Not as strongly imbued with alcohol as the name might lead one to assume, this beer was a very nice starting point. 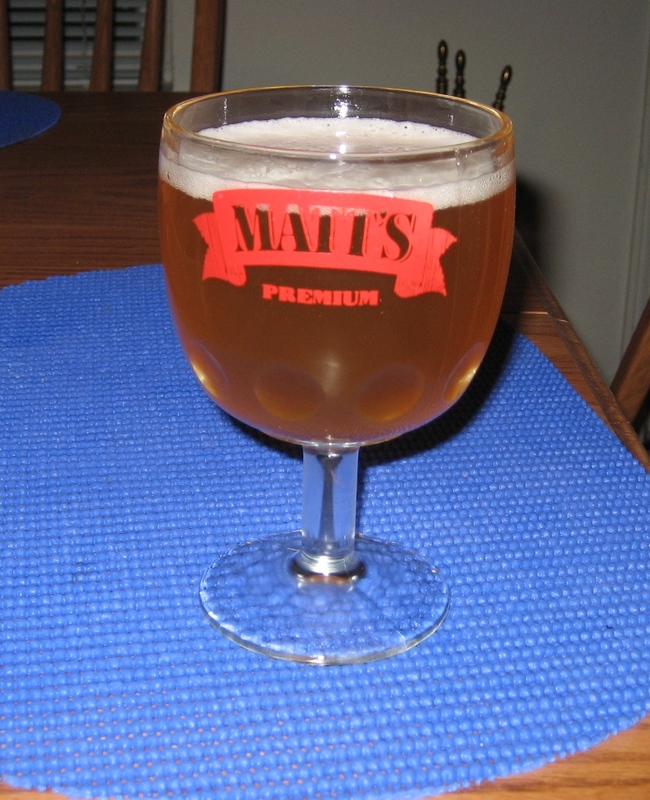 It had the characteristic complexity of a Belgian, I picked up a lot of cloves, and some raisiny goodness. I give the Thunder Monkey a 3.75 mug rating. The main event was the Impérial. I wasn't all that blown away. The first thing to jump out at me was when I stuck my nose in the glass and was transported not to Brussels, but to some strange Blade-Runneresque multicultural universe. This beer had the usual thickness and fruitiness of a Belgian, but it smelled to me like the whole affair had been doused in soy sauce, not a smell I'm accustomed to in this context. I was really thrown off by the soy sauce smell I kept getting, and couldn't move beyond it. I also had some trouble getting past the strong alcohol taste to get to the other flavors that I'm sure were there. 2 mugs. Well, the secret’s out. The days of ducking into Brugge Brasserie on a weeknight and immediately scoring a table are over. We visited on a Thursday night and waited an astoundingly long time to be seated – great news for Brugge, but not so great news for my frites-craving stomach. At the bar, the five of us warmed up with the Thunder Monkey, a cloudy copper-colored Belgian ale with a yeasty, sweet peppery nose that reminded me a lot of grains of paradise. The taste was somewhat overpowering at first; there’s a TON of spice in this beer! Cloves, raisins, ginger, your Aunt Thelma’s fruitcake… it’s all there. As it warmed, I could taste more of a bready caramel. This is my idea of a great holiday beer – substantial enough to keep your brain occupied while you listen to the aforementioned aunt extol the virtues of a high colonic. * 4 mugs. After the Thunder Monkey, we moved on to the Impérial, a Belgian-inspired imperial amber. Though this beer looked like the Thunder Monkey upon first pour, that’s where the similarity ended. I’m sure that this would be a fantastic choice if I were a fan of heady, high alcohol note beer. As the Impérial warmed, it reminded me of a barleywine I once tried at the Broad Ripple Brewpub that had not yet been hopped. A sweet, malty punch in the teeth, to be sure, but more than I could really handle. Even the soothing frites did little to balance out the overwhelming alcohol taste I was getting up front. Kudos to Brugge for not being afraid to branch out in new and creative directions, but this one just wasn’t for me. 2 mugs. Thunder Monkey - no notes. 3.95 Mugs. Brugge Impérial – This had a bit of a smoky nose, but I am not sure if the wonderful food smells were messing with me. I think the Impérial is fruity and sweet and I didn't think the alcohol taste was as prevalent as the other Knights may have mentioned. 4 Mugs. did they still have some Lupulin L'Amore left? I need to get me some more of that. Do they do Growler's there either? I've never thought to ask. I believe the answer to both of your questions is no. They should. A growler fill of the Black would be a beautiful thing. Soon enough (is it ever soon enough?) you should be able to pick up the black in your favorite local liquor store. Lupulin L'Amore was a Pro-Am beer for the Great American Beer Fest, but I think Ted may brew a batch again sometime (I'm just the "Am", so I have no pull with what he brews, LOL). However, I did just bottle some of the home-brewed version...(that goes by the slightly different name Lupulin L'Amour).